Blackberry 8703e Offered by Verizon | BlackBerry Blast! 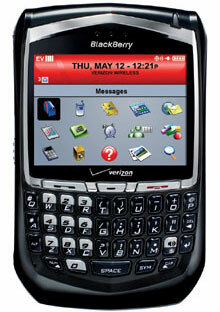 Verizon is finally offering a version of the Blackberry 8700 series device. The 8703e sports a 320x240 screen as well as Bluetooth compatibility. It does not have a camera but it is small and light weighing only 4 0z. It can be yours for $249 with a two-year contract or $399 with a one-year contract. "BlackBerry 8703e helps you get more out of life by letting you stay connected to family, friends and work. It delivers complete BlackBerry� functionality, including phone, email and text messaging, browser, organizer applications, instant messaging and BroadbandAccess Connect service. Plus, its powerful processor gives you extra memory for applications and ensures a fast, responsive experience whenever you browse the web, view graphics or open attachments. With its familiar QWERTY style keyboard layout, you can quickly and accurately compose messages."